Kurta designing has now become a source of portraying one’s talent in fine arts for quite a long time. People with different attitudes try to look up for something that is not just new but is also created with an entirely new mind and approach towards design. The fashion industry has successfully enlightened the industry of apparels by introducing new techniques of printing as well as stitching dresses. The women of Pakistan are well known to be picky in their choices when it comes to clothing as they have a very sharp sense of reviewing a style and analyze it for being up-to-date or out of fashion. Nothing that readily available in the market appeals them and instead they need to bring a twist in their personality by wearing something different from usual. Not only this thing but they also wish to find such a stuff which can provide them with a heavenly soothig comfort all the time in order to maintain a calm mood with a cool wear. Due to these demands, the clothing market has faced and has been facing a lot of challenges in order to meet the requirement of customers. With this consideration, a beautiful collection of digitally designed and printed Kurtas has been displayed in the market on experimental basis to have a feedback of this fine collection. The time however, has shown wonders in a way that female society of our country began to grab all the stuff in this form and it was a silent feedback presenting success of this idea. 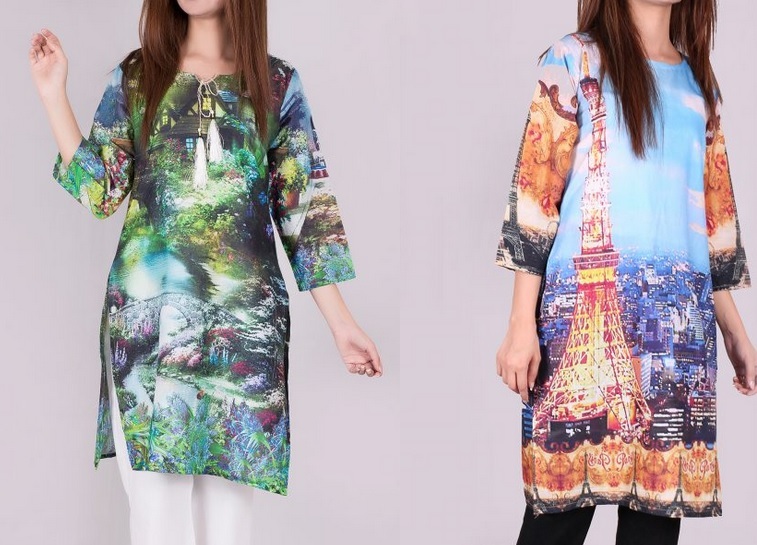 Digital printing of Kurtas has been set forward quite recently as an excitingly unique trend to overcome the great challenge and it has gathered the attention of a major number of females belonging to all age groups within the country. There is an online store for ladies shopping introduced by AroraByRoma to put a spotlight on the ever new summer collection of digital Kurta prints which is marking a vigorous change in the shopping trends of women. The magnificently achieved design of these type of Kurtas have attracted women of young as well as mature ages to enhance their appearance by putting an element of abstract printing to their dresses. This type of digital printing is constantly encouraging women to explore themselves once again with a different perspective. The abstract art is not only in the paintings any more, it is in fact making its elegant way towards the designing of Kurtas and other dresses. The fabric is comfortable to the skin as well as to eyes and is being liked by the women with all age groups. Moreover, the stuff used to make these digital Kurtas is very soft and skin friendly which will not dare to annoy you all day long. Mostly these Kurtas are mainly stitched into silky material while the beauty of lawn Kurtas with digital prints has something even more elegant that everyone easily opts to but it. So if you want to find a wide range of specially designed ladies clothes, you can easily approach online store of AroraByRoma. Previous Post:Flipkart Can Celebrate Big Billion Days Every Day. it is so cool,i really the clothes. Please share more info.